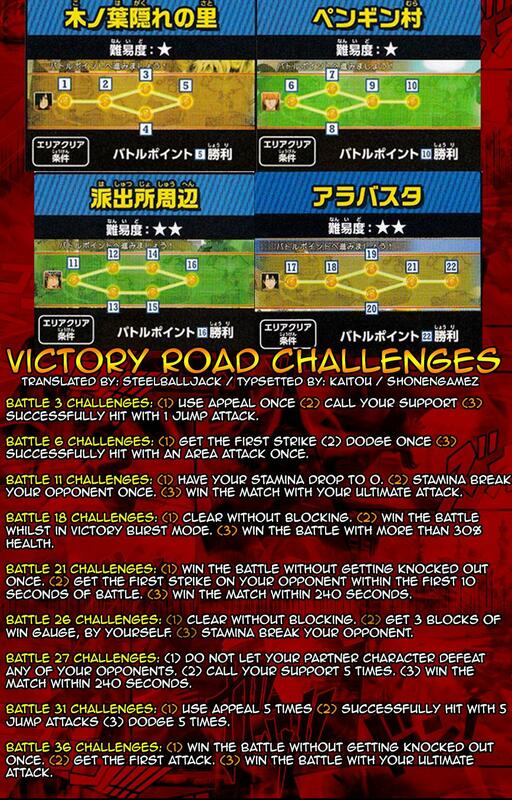 Thanks so much for this ShonenGamez I haven’t played Victory Road yet so this will surely help when I do! Thanks a bunch for these translations. They will help me go back to 100% the challenge. Thanks guys! I’ll definitely be using these when I get the game! Thanks so much SteelBallJack! It’s tough for those of us that love this game but can’t enjoy it fully because of the language barrier, but knowing there are people like you out there working hard to help us enjoy it more and more is really amazing! Please keep up the great work! *edit. ok i got it.I just fought endless fights in victory mode lol, but now last question, is Saint Seiya stage the last stage in Victory mode, or if i fight more theres something more to appear? Exactly how it sounds. Jump in the air and press your attack button and hit them. What’s the meaning have no players in challenge 41 ?? Battle missions are all you need. The rest that don’t have objectives you have to just beat them. How can we translate nothing? So friend can not understand this area successfully hit with 5 attacks. could someone help me please! 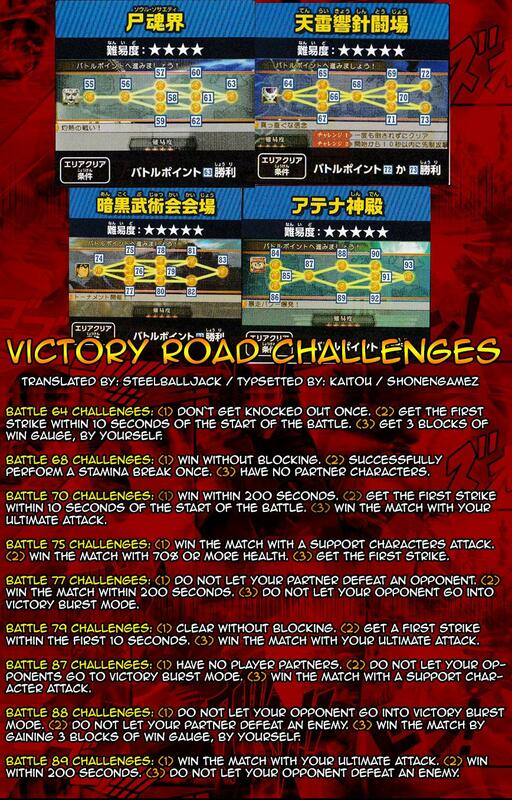 There is a mistake in the first image, they list the challenges for Battle 2, but mislabel it as Battle 3. 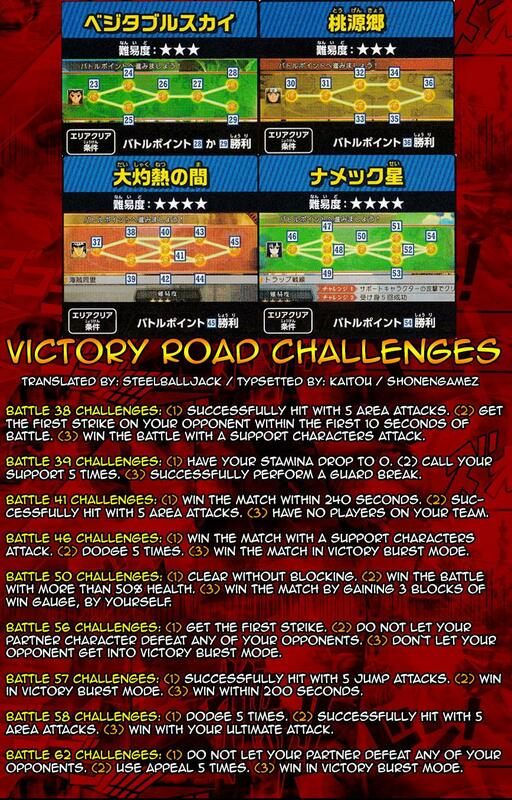 Battle 3 doesn’t have any challenges. Hope that clears up some confusion. I still don’t know what “Use Appeal” means but I somehow managed to get the gold after reading this guide, lol. Thank you shonengamez!! Land the first hit I assume. Thank you some much!!! !You are amazing!!! What does 3 block of win huge mean?